Uncertainty reins and the economic impacts of Brexit on the UK and on Europe have yet to become clear. And a big factor in the uncertainty is the political path to Brexit. The UK political class are now trying to rally around newly agreed leadership of their respective parties (assuming Labour MPs eventually manage to get rid of their current leader) and craft policies on how to engage in the divorce negotiations. A unique political feature of the UK is their first past the post (FPTP) electoral system. 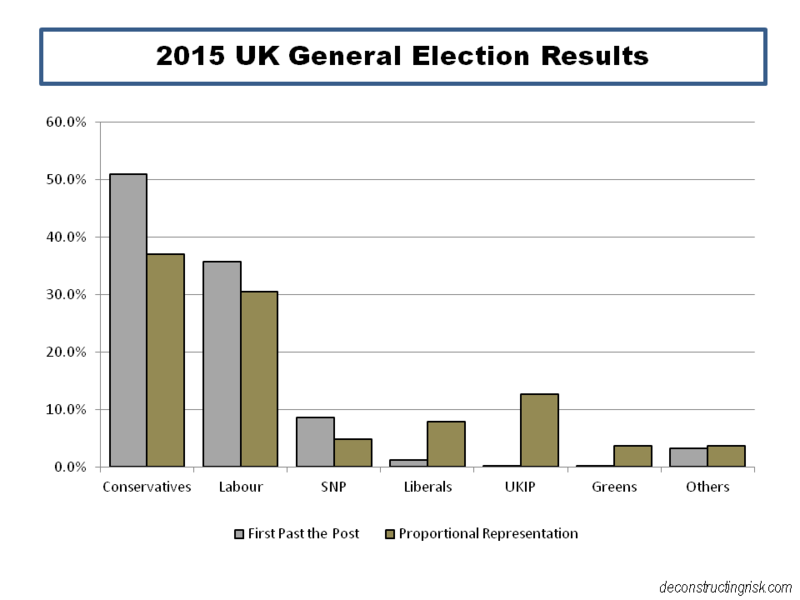 The graph below of the 2015 general election shows how the system favours the larger political parties. It also shows how parliamentary representation under FPTP can be perverse. The Scottish SNP, for example, got 4.8% of the vote but 8.6% of the members of parliament (MPs). The right wing little Englander party UKIP, whose rise in popularity was a direct cause of the decision to have a referendum on Brexit, got 12.6% of the vote but just 0.26% of the MPs. 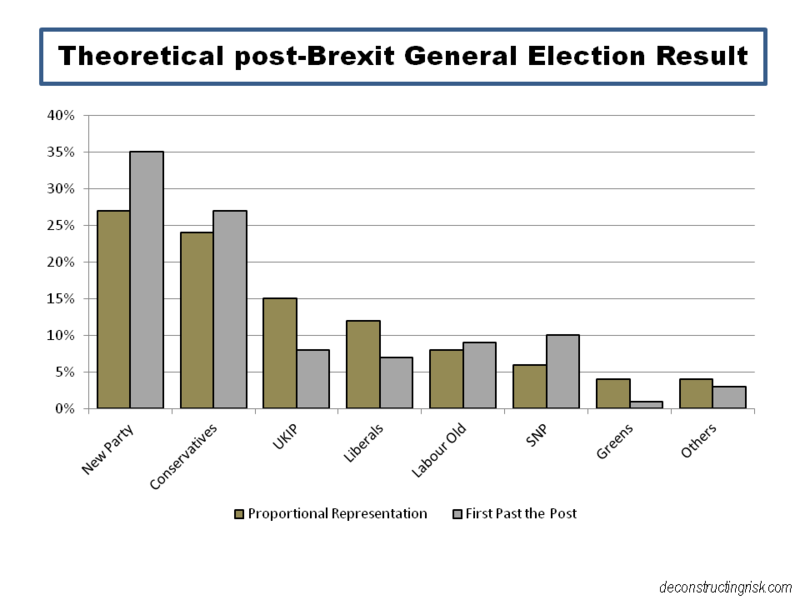 Despite its obvious failings, the British are fond of their antiquated FPTP system and voted to retain it by 68% in a 2011 referendum (albeit with a low voter turnout at 42%). One lasting impact of the Brexit vote is likely to be on the make-up of British politics. Much has been commented on the generational, educational and geographical disparities in the Brexit vote. 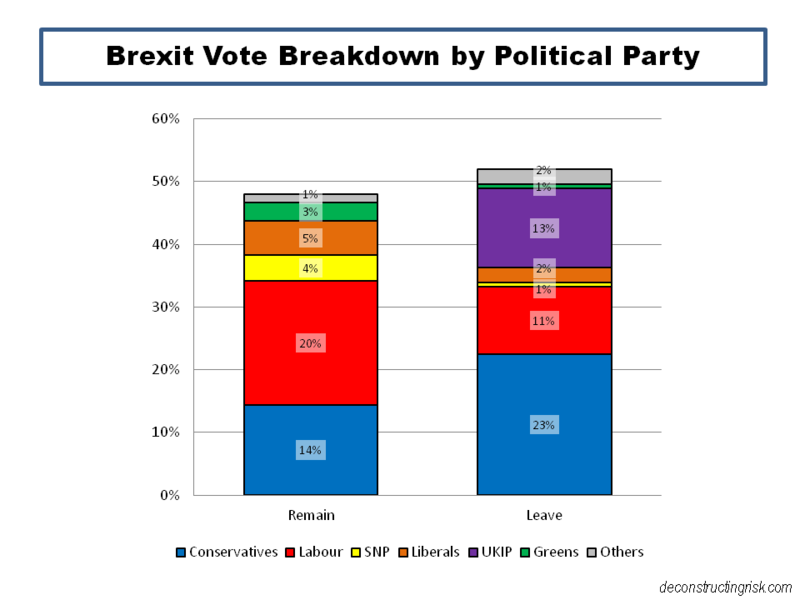 A breakdown of the leave-remain vote by the political parties, as per the graph below, shows how the issue of the EU has caused schisms within the largest two parties. Such schisms are major contributors to the uncertainty on how the Brexit divorce settlement will go. Currently both sides, the UK and the EU, have taken hard positions with Conservative politicians saying restrictions on the freedom of labour movement is a red line issue and the EU demanding that Article 50 is triggered and the UK agree the divorce terms before the future relationship can be discussed. Let’s assume that all of the different arrangements touted in the media since the vote boil down to two basic options. The first involves access to EU markets through the European Economic Area (EEA) or the European Free Trade Association in exchange for some form of free movement of labour, commonly referred to as the Norway or the Switzerland options. The second option is a bilateral trade agreement with a skills based immigration policy, commonly referred to as the Canadian option (although it’s interesting to see that there is political uncertainty in Europe over how the Canadian trade deal, which has been agreed in principle, will be ratified). I have called these option 1 and option 2 respectively (commonly referred to as soft and hard Brexit respectively). Let’s assume the negotiations on Brexit in the near future will be conducted in a sensible, rather than an emotive, manner whereby the economic impacts have been shown to be detrimental albeit not life threatening. And both sides come to realise that extreme positions are not in their interest and a workable compromise is what everybody wants. In such a scenario, I have further assumed that the vast majority (e.g. 98%) of remain voters would favour option 1 and I have judgmentally assigned political preferences for each option by political party (e.g. 90% and 75% of Conservative and Labour leave voters prefer option 2 respectively). Based upon these estimates, I calculate that there would be a 56% majority of the UK electorate in favour of option 1, as per the graph below. Now, the above thought experience makes a lot of assumptions, most of which are likely to be well off the reality. Particularly, I suspect the lack of emotive and divisive negotiations is an assumption too far. What the heck, let’s go one step further in these fanciful thoughts. Let’s assume the new leadership in the Conservative party adopt option 2 as their official policy. Let’s also assume that the Labour party splits into old labour, a left wing anti-globalisation party, and a new centre left party whose official policy is option 1. In a theoretical general election (which may be required to approve any negotiated deal), I guesstimate the result below under the unpredictable FPTP system. 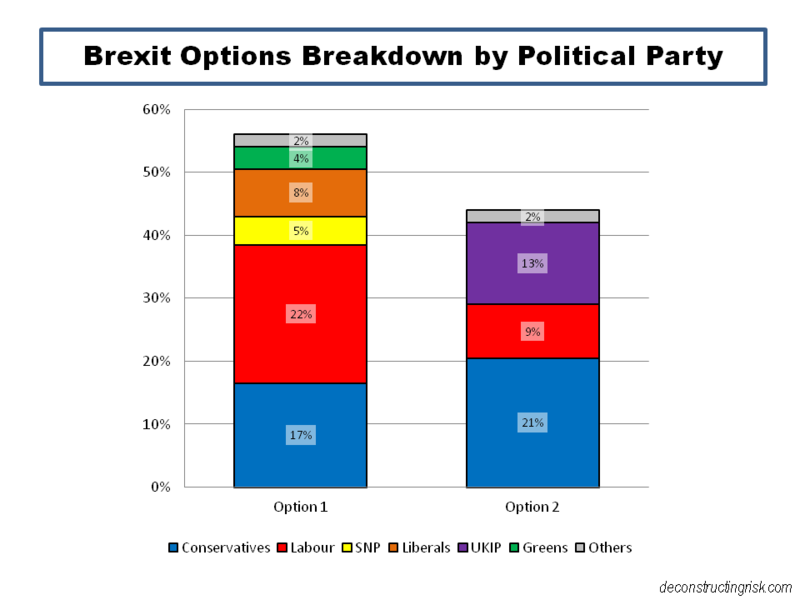 This analysis suggests a majority government of 52% of MPs with option 1 as their policy could be possible with a grand coalition of the new centre party (Labour break away party), the Liberal Democrats and the SNP. The Conservatives and UKIP could, in this scenario, only manage 35% between them (the old labour party at 9% of MPs wouldn’t tolerate to join such a combination no matter what their views on the EU). The net result would be a dramatic shift in UK politics with Europe as a defining issue for the future. Back to today’s mucky and uncertain reality…. Follow-up: I thought I was been clever with the title of this post and I only realised after posting it that the Economist used it in their title this week! Is there nothing original any more…. This entry was posted in General and tagged Anarchy in the UK, Article 50, bilateral trade agreement, Brexit, brexit anarchy, brexit divorce, brexit economic impact, Brexit generational, Brexit geographical disparities, Brexit vote, British politics, Canadian option, Canadian trade deal, conservative, conservative leadership, divorce terms, EEA, European Economic Area, European Free Trade Association, European Union, first past the post, freedom of labour movement, general election, labour, labour leadership, leave remain vote, left wing anti-globalisation party, liberal democrats, Lisbon Treaty, little Englander, members of parliament, MPs, new UK political party, Norway option, political parties, political schisms, political uncertainty, post brexit general election, referendum, right wing, Scottish SNP, skills based immigration policy, Switzerland option, UK electoral system, UK political class, UKIP, uncertainty. Bookmark the permalink. PS: I have some thoughts regarding Naive Newcomers, will post later.